The Power of Collaboration: Make 1+1=3 (Or More!). In today's hyper competitive healthcare environment, the process of taking an innovation to market successfully means throwing out the old playbook and building the right team. Health innovators need to stretch beyond their own personal strengths (and the strengths of their internal marketing teams) to create a diversified team with commercialization expertise that can help lead the way toward commercial success and maximum ROI. The difference between launching and commercializing an innovation. The skills and capabilities required for innovation success. How to evaluate your current in-house capabilities. How to choose the right CoI team to launch and commercialize your innovation. As you think about who should help bring your innovation to market, ask yourself: Do I want to make the most of my business and product exposure opportunities? Or, do I want to maximize ROI from your innovation? 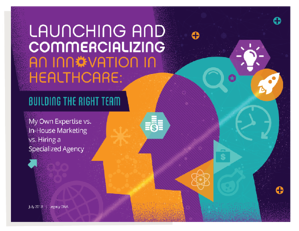 Download the eBook for a more in-depth conversation on how to maximize ROI, circumvent failure, and successfully launch your healthcare innovation! In the new value-based world of healthcare, many of the innovations brought to market seek to drive improvements in the quality and cost of healthcare. Increasing commercial success is the only way toward healthier communities.